Ever urged to break a world record? or make Pakistan proud? or both? We, a dedicated team "Hum Aik Hain", have taken the initiative to break the world record for the largest human national flag. We believe its about time that we showed the world, no matter how hard the circumstances are, we will always stay united. Join hands with us in this noble attempt, each head that rises up and comes forward shall play a part in bringing glory to Pakistan. The current record for the largest human national flag stands at 21,726 participants and we tend to raise the bar to 25,000 people. 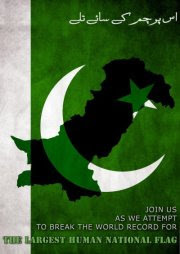 Hum aik hain Hum aik hain"